Hi and thanks for any help that can be given, I have a 2005 X5 3.0d sport and i have noticed that the car powers down after the 16 mins but then powers up again around 50 mins later? I have tried the double locking and have still got the problem. I noticed that the interior light came on during the night every so often. I have now had a flat battery due to this can anyone point me in the right direction? 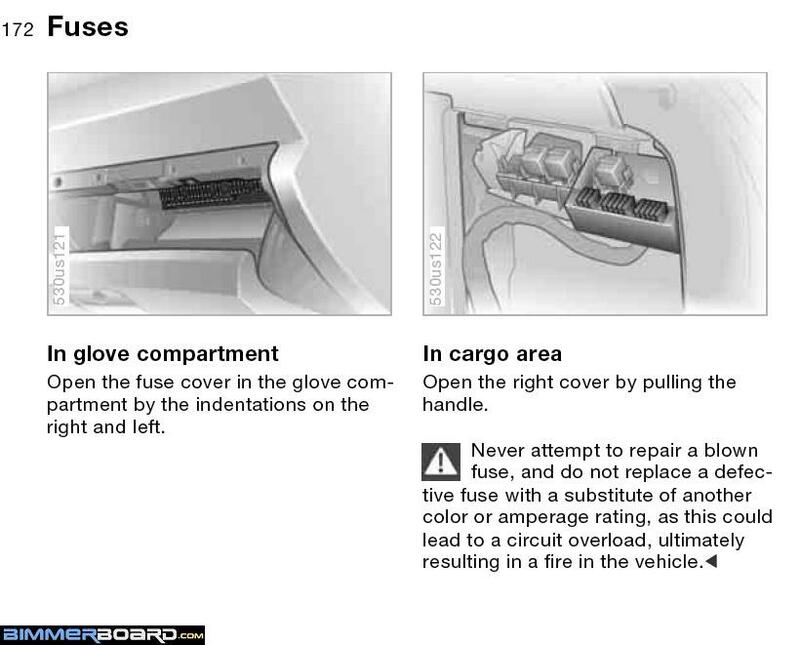 Thanks noticed after driving that the door open flashes on the dash when i am driving, how do i know what door it is? and could this cause my issues? Could be that one of the door switches may be failing, though that ought to trip the alarm as well. 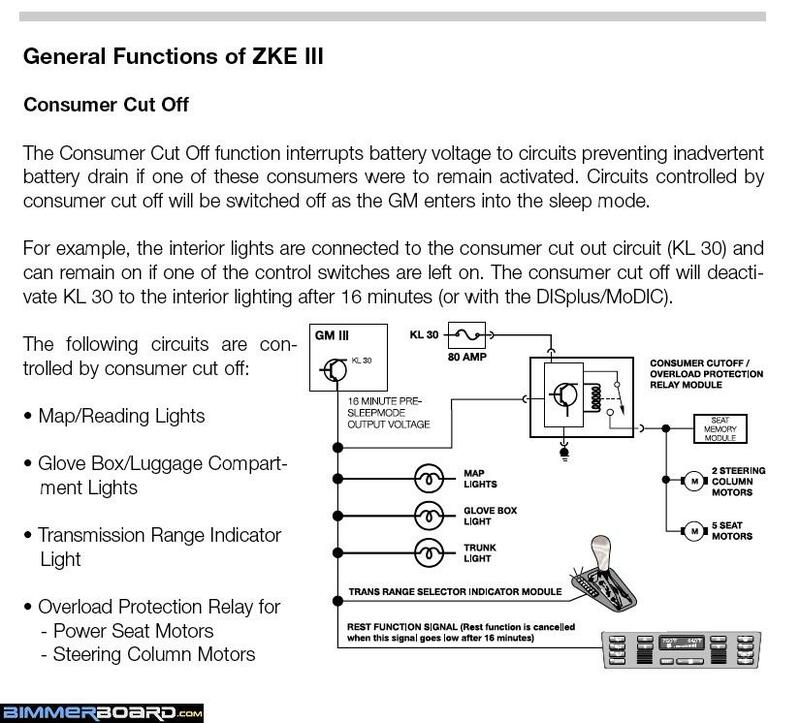 It will ‘wake’ the car every time and that powers up some of the modules - hence killing your battery. Try pressing the interior light switch master button (overhead) for three seconds to turn the interior lighting off permanently. I’ve searched for the interior light switch/door contact on Realoem and newtis.info and can’t find a drawing or fix it guide. Someone who has worked on these switches may know where it’s located on each door. The contacts send a signal to the Light Control Module. Hi and thanks, I have tried cleaning the door contacts and i have inpa 1.4 and have noticed that when i run a diagnostic it shows that i have the telephone fault but i do not have the telephone.. could this be waking the car up? Does anybody recommend an independent BMW tech in the Glasgow area? The answer for the telephone thing is to pull fuse 74. However if you haven't a phone you may not have a fuse! Best to check though. Besides the telephone, the other cause I have searched the t'internet and found is the heater fan control waking up the car. How and why is beyond me - much like the phone issue. How this is diagnosed I don't know but maybe a scan would show what was the cause of the wake up. Mine did it to me the other week. I normally leave the car a week or so and everything is usually fine. However I left it for a week at the airport and came back to find the battery down enough for it not to start. It did open on the button and start the air suspension compressor, but by the time I came to start it there wasn't enough battery juice left. A quick jump from a battery and we were away. That's when I trawled the net looking for answers. I still haven't done any further checking but as of today it is still Ok and started after a week's rest. Hi and thanks, yes i searched for days for answers but to no avail.. I'm sitting here watching the interior lights go on and off at random and the alarm triggering when it wants...... me thinks that it's going to BMW for update and check as a lot of the modules are not showing up on the inpa 1.4.
thanks and I'll keep you's updated. A lot don't show in 1.4 only about half of the first page you know what i mean might not even be half of the ones on that page but not far off. What happens if you don't lock the car ?. Edit I take it by 1.4 you are actually using bmw scanner 1.4.0 (P A Soft 1.4.0). 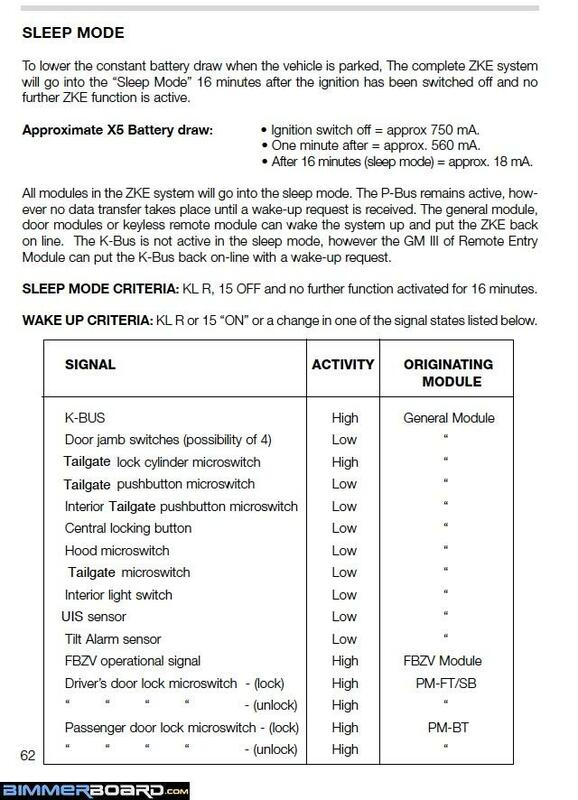 Thanks yes i am using PA 1.4 and when i leave it unlocked it still puts the interior lights on>> is there a better scanner that would show all the modules? Yes INPA but not as easy to use. Hi and thanks for the help.. I have noticed that the fan in the heater control unit still runs after the car is switched off is this normal? No not normal but a common fault. (And your main problem). Do a search for FSR (final stage resistor) or Hedgehog. That will be your problem i think and not a bad job on the e53 but you do need to be a bit of a contortionist but very doable yourself. Thanks i have just ordered one..I will let you know how it goes..